True love exists and subsists forever in a place where there is no space and time. When two souls are connected through the heart, nothing can break this unity. Celebrate this connection with this sterling silver necklace, full of meaning. The centerpiece of this necklace is an exquisite and finely detailed angel wing sophistically set with shimmering crystals running on the right side of the angel wing. A dainty rose gold butterfly sits on the pendant. 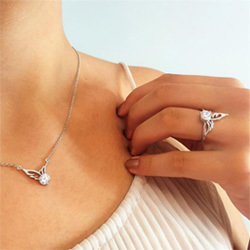 The wings of the butterfly are slightly raised, capturing the beauty of a butterfly’s flight and providing a unique opportunity to channel that beauty in a timeless fashion. The angel wing holds a heartfelt sentiment “One day our souls will dance together again”, beautifully paying tribute to a loved one. A second butterfly is placed onto the chain, to vividly express the preciousness of the connection you share. As you wear this necklace, may it remind you of times together. May the memories hold a special place in your heart for always and forever. I love this necklace ,I lost my sweet mom in OCTOBER, she was 98 and still DANCING. My husband got it for me as a remembrance. It was the perfect gift. Such good quality. It’s really more beautiful in person. I love this necklace.. I haven't taken it off since it arrived. The pendant is truly beautiful. It is larger than I thought but I will be able to wear it proudly.